When did you discover a love for acting? Tell us about your journey to ETSU. I knew I wanted to go away to school, so when I visited ETSU, my grandmother came with me. 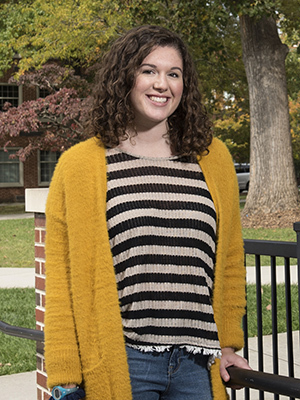 She is a graduate of ETSU and loved seeing all the changes that had occurred on campus. While we were here, we saw a performance of “Othello” that was presented by ETSU’s Department of Theatre and Dance. Another major drawing factor was the Honors College. Programs like the Fine and Performing Arts Scholars program are very unique, and I was fortunate to receive one of the scholarships. You are now getting ready for your next ETSU production. Tell us about it. The story is familiar, but it is a much different presentation. “Ken Ludwig’s Baskerville: A Sherlock Holmes Mystery” follows Holmes and Watson on one of their most famous cases, but in this show, we have an actor playing Holmes, another actor appearing as Watson, and the rest of the characters are played by me and two other actors – and that’s it! We have a lot of quick costume changes, and I have had to learn several dialects – cockney, British, German, Scottish, and Irish. We also have four other actors on stage who play the Irregulars and help with fast scene changes. We are having a blast. Looking back, this is your third appearance on the Bud Frank stage, correct? Yes, my first role was as Edith Frank in “The Diary of Anne Frank,” and earlier this year I was cast in “Dead Man’s Cell Phone.” Being in “The Diary of Anne Frank” has special significance to me because I saw that play at Knoxville Children’s Theatre several years ago and it made me want to get involved in theater. What do you like most about the Department of Theatre and Dance? It’s the people. We have been able to form close relationships, not just in class but also during rehearsals. Those are the connections that last forever. The faculty are also amazing. I really appreciate how evident it is that they want to see each of us succeed. They are deeply involved in our theater learning experiences.